William Mawby was born in south Leicestershire in 1843 and joined the British Army in 1861 as a recruit based in York. He married Mary Ann Wilkins, born in Snarestone, Leics. in 1870 and during his posting in Gibraltar his two children were born there including Charles in 1881. William moved with the British Army and can be found in Mauritius, Alderney, Jersey and Dover. At the time of his death he was a Master Gunner in the Coast Brigade Royal Artillery with Service Number 188. 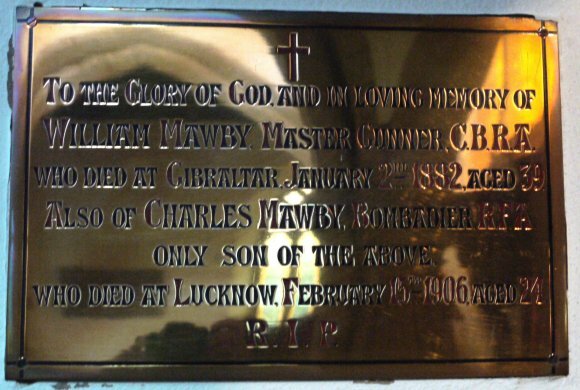 His son, Charles, Acting Bombardier 33949 Royal Field Artillery died in India from enteric fever on the 15th February 1906 and buried on the 16th February 1906 in Lucknow, India. 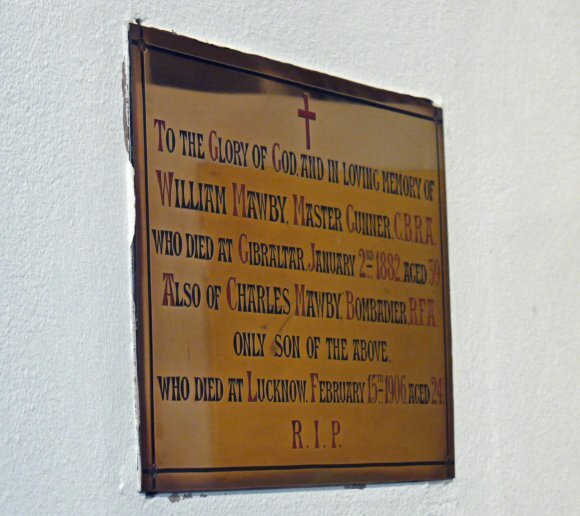 On the death of her husband, William Mawby, Mary Ann married William Davis, a General Dealer and the family, including Charles and his sister Alice Elizabeth lived in Woodgate, Rothley. This is the Rothley connection to this memorial plaque.